On our first day here we dropped into a barber so Richard could get his hair cut. As has been the case in most other places we’ve visited, a few people who were sitting in the shop struck up a conversation and suggested we share some tea in their cafe after we’d finished. 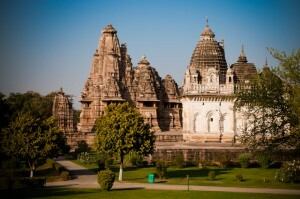 We spent an hour or two having chai and then went to see the main attraction in this town, the ‘western’ group of temples, featuring sandstone Karma Sutra carvings. The temples are really beautiful, dating back to the 10th century and set within the surrounds of a really well-maintained and quiet park. The main street of the town overlooks the park and the temples and features a strip of rooftop restaurants with an idyllic view that makes it difficult to walk away. Yesterday we took a trip out of town on an auto-rickshaw with our friend from the cafe. We have a newfound respect for these three-wheeled machines, otherwise known as ‘Indian helicopters’, as this one managed to take us down some pretty bumpy and rough roads. We spent a few hours wandering around the national park and fending off monkeys along the way. The park is also apparently home to tigers, although none have been seen for several years. Afterwards we visited a riverside retreat and had a lunch break, where our friend asked if we would like to hear the bird calling skills he’d been talking about earlier. He managed to call about a hundred crows from all around by making bizarre bird calls. Within seconds the crows were circling around and above us, flying out of sight only once he “told them to leave”. 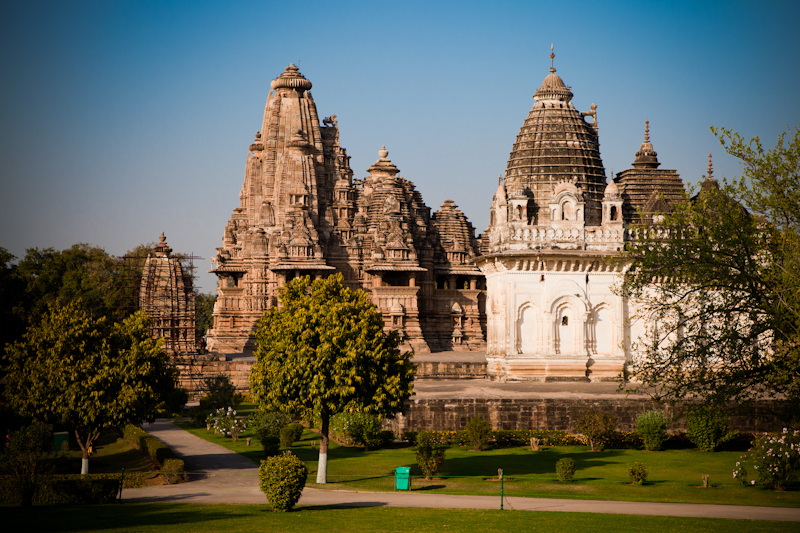 On our last day in Khajuraho we wandered around the southern and eastern groups of temples – not quite so well presented but no less magnificent than the western group. 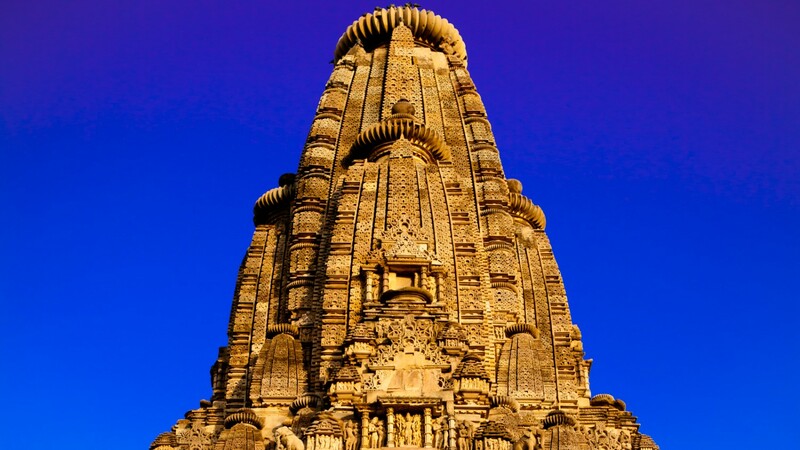 Instead of being set within garden surrounds these temples looked more like tall sandstone sculptures rising out of the dusty landscape. The weather has gotten steadily warmer since our arrival in India six weeks ago, making it difficult to wander around in the heat of the day, so we decided to take the afternoon off sight-seeing to spend the rest of the day overlooking the temples at one of the rooftop restaurants.